System provides reliability, security and extreme scalability for real time viewing and analytics-based monitoring in multi-million-camera networks. SAN JOSE, CALIFORNIA, March 12, 2019 – IntelliVision Technologies Corp. (IntelliVision®), a pioneer and leader in artificial intelligence and deep learning video and audio analytics software for smart cameras and a subsidiary of Nortek Security & Control LLC (NSC), today announced it has been granted a patent by the United States Patent and Trademark Office titled “System and Method for Scalable Could Services,” number US 10,142,381 B2. 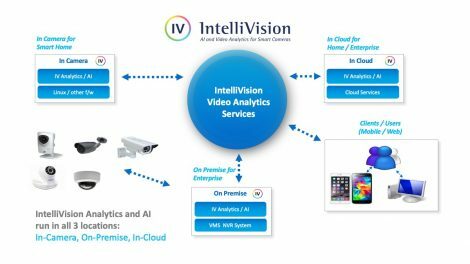 This technology of scalable cloud-based services is a key component of the IntelliVision video analytics service, which can also be deployed on the device or at the local server level. The system usually runs over cloud services such as Amazon EC2®, Microsoft Windows Azure® or the Google App Engine®. End-users can easily set up and configure cameras for their monitoring needs and view the camera streams live using their mobile devices. Analytics events are stored and managed in the cloud through these video cloud services.